Some distance learning courses require students to research additional sources of information outside the basic course. Therefore, it's important that you reference this research correctly when you send in your unit assessments/assignments. Although you will not be expected to provide references in the same way you might if you were studying at university level, it’s still important that the information you give leads the tutor to the source directly. One of the reasons that you need to reference accurately is so that, if necessary, your tutor can read the text from any documents you have sourced and ensure that you have not copied them word for word. You should always provide information you have sourced in your own words because if the information you choose to use is subject to copyright (which most will be) then you may be accused of ‘plagiarism’. This word means copying written text from the author without permission and passing it off as your own work. Although, it is often reasonable to copy a phrase or sentence from someone else’s work if it helps to support what you are saying in your assignment - but you must ensure you give the author credit for the text by adding quotation marks and giving their name in brackets directly after the phrase or sentence. 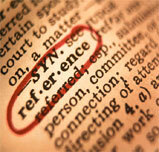 You should then provide all your references at the end of the assignment in full. The type of details your tutor will need are the same details that you would need if you wanted to locate some specific information yourself. For example, is your source from a book, magazine, or perhaps a website? What is the publication called and what is the page number or website link/page? Once you have supplied these details you should feel confident that you have referenced your work appropriately, and you will hopefully have impressed your tutor ! Andersen Counselling & Advice, Chelmsford, Essex UK.